What is Dividend Coverage Ratio (DCR)? 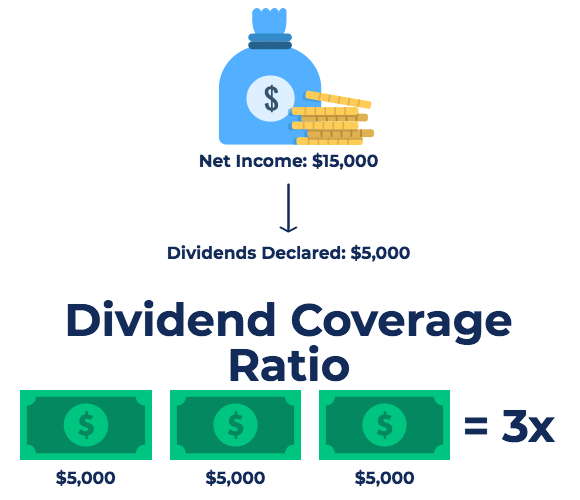 The Dividend Coverage Ratio, also known as dividend cover, is a financial metric that measures the number of times that a company can pay dividends to its shareholders. The dividend coverage ratio is the ratio of the company’s net incomeNet IncomeNet Income is a key line item, not only in the income statement, but in all three core financial statements. While it is arrived at through the income statement, the net profit is also used in both the balance sheet and the cash flow statement. divided by the dividend paid to shareholdersStockholders EquityStockholders Equity (also known as Shareholders Equity) is an account on a company's balance sheet that consists of share capital plus retained earnings. It also represents the residual value of assets minus liabilities. By rearranging the original accounting equation, we get Stockholders Equity = Assets – Liabilities. 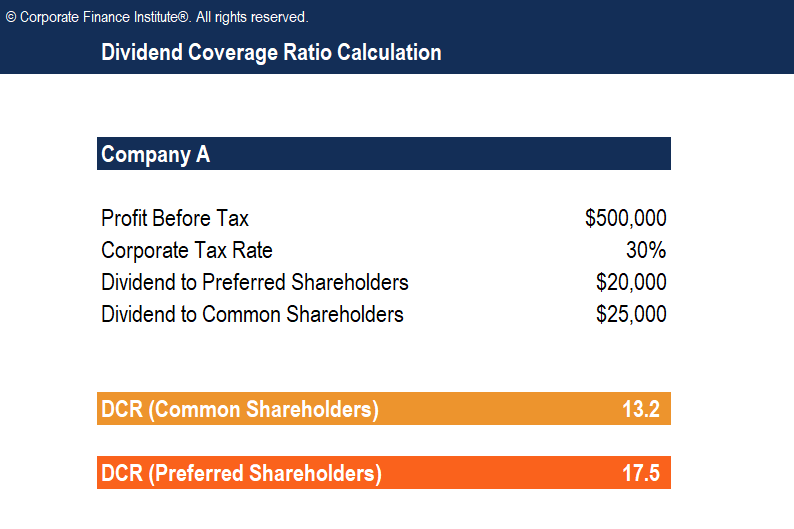 There are also some modified versions of the dividend coverage ratio, which will be discussed below. The first variation is used to determine the number of times a company can pay dividends to common shareholders when the company also has preferred sharesCost of Preferred StockThe cost of preferred stock to the company is effectively the price it pays in return for the income it gets from issuing and selling the stock. Download the free calculator template to determine the cost of preferred stock based on the company's preferred dividend payment, share price to take into consideration. If the dividend coverage ratio is greater than 1, it indicates that the earnings generated by the company are enough to serve shareholders with their dividends. As a rule of thumb, a DCR above 2 is considered good. A deteriorating DCR or a dividend cover that is consistently below 1.5 may be a cause for concern for shareholders. A consistently low or a deteriorating dividend cover may signal poor company profitability in the future, which may mean the company will be unable to sustain its current level of dividend payouts. In calculating a company’s DCR, we use net income in the numerator. Net income does not necessarily equal cash flowCash Flow Statement​A Cash Flow Statement (officially called the Statement of Cash Flows) contains information on how much cash a company has generated and used during a given period. It contains 3 sections: cash from operations, cash from investing and cash from financing.. Therefore, a company may report a fairly high net income but still not actually have the cash available to make dividend payments. Net income can change dramatically from one year to the next. Therefore, calculating a high DCR based on past historical performance may not be a reliable predictor of dividend risk in future years. Nonetheless, the dividend cover is still commonly used by investors and market analysts to estimate the level of risk associated with receiving dividends from an investment. The dividend coverage ratio measures the number of times a company can pay its current level of dividends to shareholders. A DCR above 2 is considered a healthy ratio. A DCR below 1.5 may be a cause for concern. The DCR uses net income, which is not actual cash flow. Therefore, even a high net income does not guarantee adequate cash flows to fund dividend payments. The DCR is a fairly poor indicator of future risk. Net income can vary greatly from year to year, so looking at a company’s historical DCR is not a definitive measure of future dividend risk.